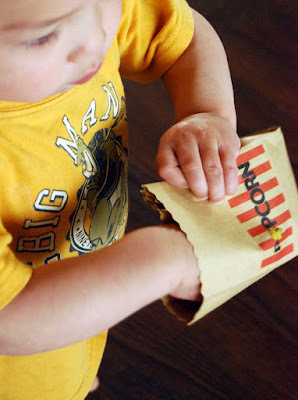 My boys love to pop and eat popcorn and I thought it would be fun to make popcorn bags for this printable. Cut along the outer line. Fold the tab and center line. (I labeled the lines with an A to distinguish them from the others.) Glue the tab to the sheet. Fold the two lines on the sides as shown above. Unfold..
Open the bag and re-fold the side so the center line is into the bag as shown above in the third pictured. Repeat for the other side. 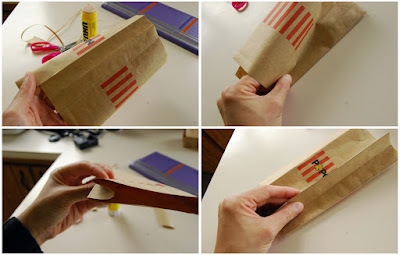 Place glue on the bottom tab and fold it up to glue in place. You can leave it as is or you can cut the top of the bag with a pair of zig-zag pattern, craft scissor...and Voila! 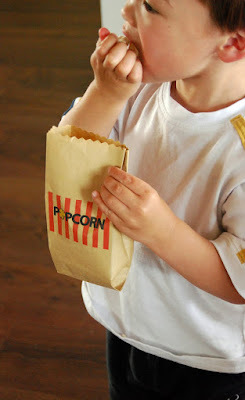 The boys seem to think the bags were fun, but I think it was the popcorn they liked more. Love those bags! Thanks for sharing your design! I've linked to you at One Crafty Place. OMG THEY ARE AWESOME!! LUCIUS AND AYMERIC LOOK SOOO ADORABLE! These are so, SO cute! How perfect for camping and outdoor movie nights?!?! I'm so excited about these! Thanks tons, I'll be linking. I tried to download the pdf, it asked for a password. :( I want to try to make one. 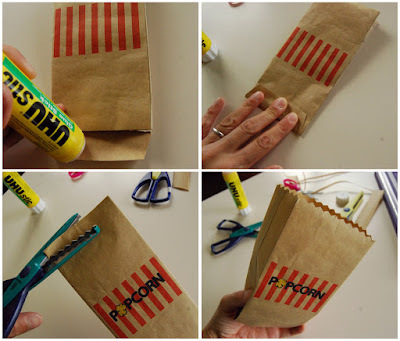 I edited the post with an alternative link for the printable popcorn bag. Hope it works now! These are great! Thank you! I've started hosting a Ladies movie night once a month and these will be perfect! 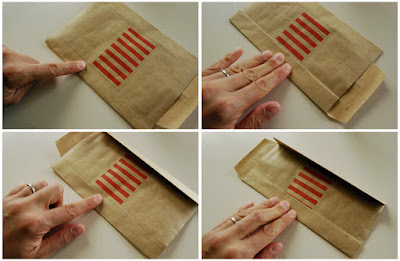 i recently tried printing on regular brown paper lunch bag as to-go bags for a shower i threw. it came out okay, but maybe i should've done something more like this so it'd come out crisper. your design, as usual, is super cute! What a great idea! I might do this for my little one's Birthday party. I shared it with my readers at B.Inspired Mama! 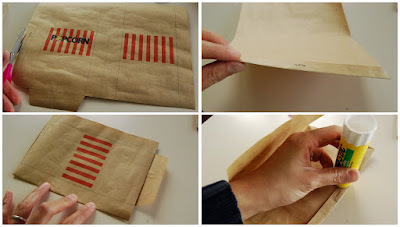 could you print these on brown paper bags instead of making your own? Really great. Made it just now and it's so cute! I put a free pass to the cinemas in it as a gift. Thank you!